Watson Jeopardy! computer: Ken Jennings describes what it's like to play against a machine. Jeopardy! genius Ken Jennings on what it’s like to play against a supercomputer. Ken Jennings competes against Watson in 2011 in Yorktown Heights, New York. When I was selected as one of the two human players to be pitted against IBM’s “Watson” supercomputer in a special man-vs.-machine Jeopardy! exhibition match, I felt honored, even heroic. I envisioned myself as the Great Carbon-Based Hope against a new generation of thinking machines—which, if Hollywood is to be believed, will inevitably run amok, build unstoppable robot shells, and destroy us all. But at IBM’s Thomas J. Watson Research Lab, an Eero Saarinen-designed fortress in the snowy wilds of New York’s Westchester County, where the shows taped last month, I wasn’t the hero at all. I was the villain. This was to be an away game for humanity, I realized as I walked onto the slightly-smaller-than-regulation Jeopardy! set that had been mocked up in the building’s main auditorium. In the middle of the floor was a huge image of Watson’s on-camera avatar, a glowing blue ball crisscrossed by “threads” of thought—42 threads, to be precise, an in-joke for Douglas Adams fans. The stands were full of hopeful IBM programmers and executives, whispering excitedly and pumping their fists every time their digital darling nailed a question. A Watson loss would be invigorating for Luddites and computer-phobes everywhere, but bad news for IBM shareholders. The IBM team had every reason to be hopeful. Watson seems to represent a giant leap forward in the field of natural-language processing—the ability to understand and respond to everyday English, the way Ask Jeeves did (with uneven results) in the dot-com boom. Jeopardy! clues cover an open domain of human knowledge—every subject imaginable—and are full of booby traps for computers: puns, slang, wordplay, oblique allusions. But in just a few years, Watson has learned—yes, it learns—to deal with some of the myriad complexities of English. When it sees the word “Blondie,” it’s very good at figuring out whether Jeopardy! means the cookie, the comic strip, or the new-wave band. I expected Watson’s bag of cognitive tricks to be fairly shallow, but I felt an uneasy sense of familiarity as its programmers briefed us before the big match: The computer’s techniques for unraveling Jeopardy! clues sounded just like mine. That machine zeroes in on key words in a clue, then combs its memory (in Watson’s case, a 15-terabyte data bank of human knowledge) for clusters of associations with those words. It rigorously checks the top hits against all the contextual information it can muster: the category name; the kind of answer being sought; the time, place, and gender hinted at in the clue; and so on. And when it feels “sure” enough, it decides to buzz. This is all an instant, intuitive process for a human Jeopardy! player, but I felt convinced that under the hood my brain was doing more or less the same thing. Indeed, playing against Watson turned out to be a lot like any other Jeopardy! game, though out of the corner of my eye I could see that the middle player had a plasma screen for a face. 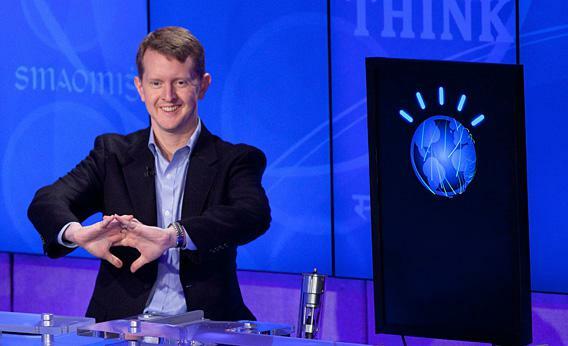 Watson has lots in common with a top-ranked human Jeopardy! player: It’s very smart, very fast, speaks in an uneven monotone, and has never known the touch of a woman. But unlike us, Watson cannot be intimidated. It never gets cocky or discouraged. It plays its game coldly, implacably, always offering a perfectly timed buzz when it’s confident about an answer. Jeopardy! devotees know that buzzer skill is crucial—games between humans are more often won by the fastest thumb than the fastest brain. This advantage is only magnified when one of the “thumbs” is an electromagnetic solenoid trigged by a microsecond-precise jolt of current. I knew it would take some lucky breaks to keep up with the computer, since it couldn’t be beaten on speed. During my 2004 Jeopardy! streak, I was accustomed to mowing down players already demoralized at having to play a long-standing winner like me. But against Watson I felt like the underdog, and as a result I started out too aggressively, blowing high-dollar-value questions on the decade in which the first crossword puzzle appeared (the 1910s) and the handicap of Olympic gymnast George Eyser (he was missing his left leg). At the end of the first game, Watson had what seemed like an insurmountable lead of more than $30,000. I tried to keep my chin up, but in the back of my mind, I was already thinking about a possible consolation prize: a second-place finish ahead of the show’s other human contestant and my quiz-show archrival, undefeated Jeopardy! phenom Brad Rutter. In the final round, I made up ground against Watson by finding the first “Daily Double” clue, and all three of us began furiously hunting for the second one, which we knew was my only hope for catching Watson. (Daily Doubles aren’t distributed randomly across the board; as Watson well knows, they’re more likely to be in some places than others.) By process of elimination, I became convinced it was hiding in the “Legal E’s” category, and, given a 50-50 chance between two clues, chose the $1200 one. No dice. Watson took control of the board and chose “Legal E’s” for $1600. There was the Daily Double. Game over for humanity. IBM has bragged to the media that Watson’s question-answering skills are good for more than annoying Alex Trebek. The company sees a future in which fields like medical diagnosis, business analytics, and tech support are automated by question-answering software like Watson. Just as factory jobs were eliminated in the 20th century by new assembly-line robots, Brad and I were the first knowledge-industry workers put out of work by the new generation of “thinking” machines. “Quiz show contestant” may be the first job made redundant by Watson, but I’m sure it won’t be the last. But there’s no shame in losing to silicon, I thought to myself as I greeted the (suddenly friendlier) team of IBM engineers after the match. After all, I don’t have 2,880 processor cores and 15 terabytes of reference works at my disposal—nor can I buzz in with perfect timing whenever I know an answer. My puny human brain, just a few bucks worth of water, salts, and proteins, hung in there just fine against a jillion-dollar supercomputer. “Watching you on Jeopardy! is what inspired the whole project,” one IBM engineer told me, consolingly. “And we looked at your games over and over, your style of play. There’s a lot of you in Watson.” I understood then why the engineers wanted to beat me so badly: To them, I wasn’t the good guy, playing for the human race. That was Watson’s role, as a symbol and product of human innovation and ingenuity. So my defeat at the hands of a machine has a happy ending, after all. At least until the whole system becomes sentient and figures out the nuclear launch codes. But I figure that’s years away. Also in Slate, Chris Wilson says that the next IBM supercomputer should be able to play poker. Jeremy Singer-Vine crunches the numbers on the hardest clues in Jeopardy! history. Daneil D’Addario writes about a fan-maintained database that helps Jeopardy! contestants prepare. And, lastly, Slate V recounts the untold story of Watson’s other game-show appearances.